We’re fast becoming fans of Cuddledry products thanks to their great child-friendly designs. That means we were pleased to see the humble rubber duck — surely a must at bath-time — get the Cuddledry makeover. If you’re anything like us, your first thought might be “but it’s not yellow”. Indeed it’s not. 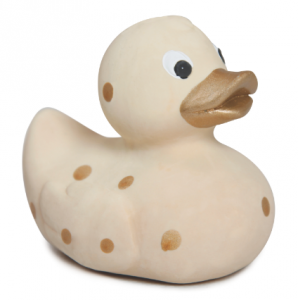 The Cuddleduck instead sports a gold polka dot design and cows in a pretty organza bag. Handmade in Spain using natural rubber, the Cuddleduck is pthalate free and non-toxic so contains no nasties for your little one. Soft and squashy for tiny hands to hold, a quick squeeze and he will give a lovely satisfying squeak to delight your baby, he even squirts water for endless bath time fun. Even better, he’s only £5.99 from cuddledry.com, so you could even splash out on a pair.